Alan Peake was admitted to the California Bar in 1988 and has also been admitted to practice law in the United States District Court Eastern District of California. He takes a very "hands on" approach to the matters he handles and is readily accessible to his clients. The primary emphasis of his practice is representing public agencies. He has represented numerous cities, water districts, redevelopment agencies and housing authorities as City Attorney/General Counsel. He is well versed in the areas of water law, land use law including commercial, industrial and residential development, eminent domain, environmental issues (NEPA and CEQA); all phases of real estate transactions including site acquisition, financing, sales, leases; construction law and areas related to public works contracting and construction. He has participated in numerous public financings on behalf of cities and other public agencies. He also represents private clients in litigated and non-litigated matters. He also handles landlord/tenant matters representing landlords. He has 30 years of experience in handling residential and commercial real estate leases, eviction matters and his background includes experience with tax credit properties, Section 8 housing, HUD housing, as well as representing private property owners and real property management companies. 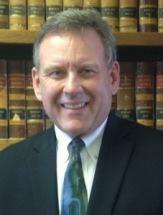 He is a member of the Kern County Bar Association and the California State Bar. The goal of his practice is to provide high quality legal services to his clients in a fast, efficient and personal manner and to ensure that costs and expenses are kept to a minimum.